Hay Bro Sis....Dash cam device later became popular for car owners. Generally, in addition to security, installing dash cam in the car can be a 'witness' in case something happens to the car during the trip. Along with this trend, Transcend, Taiwanese electronics company to offer superior products dash cam, namely DrivePro DrivePro 100 and 200. Both models will offer high quality products in a video recording that can be useful evidence of all the events. Dapurpacu.com try directly comparing the two products at once. DrivePro good DrivePro 100 and 200, has the ability to record full-quality video High Definition (Full HD) with the highest resolution of 1920 × 1080 Pixels 30 FPS. The compact design, while usage in the car does not disturb the visibility in the windshield. Most appropriate position to put it behind the rearview mirror. DrivePro 100 has a lens and a 1.8 berdiafragma 130o angle lens that promises vast area of ​​the recording. While DrivePro 200 with diaphragm 2.0, has a greater angle lens, ie by Transcend 160o which is intended to minimize blind-spot. Both DrivePro 100 and 200 rely on electricity to 12 volt power outlet in a car as its main power source, so the camera will actively follow active electrical system or the engine. However, on this side DrivePro 100 is superior because it has an internal battery Li-Polymer 470mAh which can continuously record up to 30 seconds after the ignition is turned off. As we tried both, at the time of the day or when the light of the quality of the recorded image DrivePro 100 and 200 there are no significant differences, except it looks like there is a bluish filter effect on the resultant picture DrivePro 100. Apparently, the effect of color make recordings DrivePro 100 images at night or dark brighter than DrivePro 200. Likewise with the recordings, in the same condition DrivePro 100 have voice recordings firmer and clearer than DrivePro 200. To save the recording, DrivePro 100 and 200 rely on media MicroSD card. 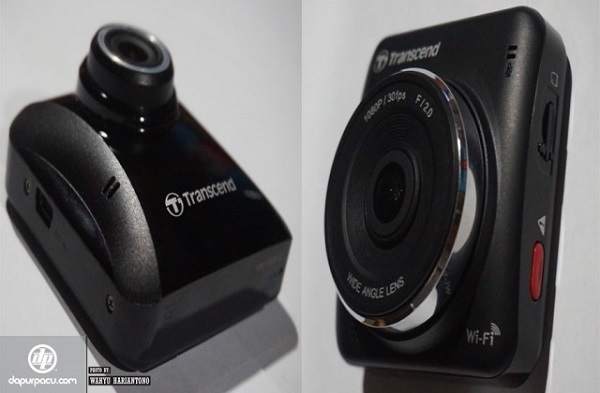 Transcend arming DrivePro 100 and 200 with G-sensor to measure G-forces experienced in a car, in which when the car had a fairly strong shocks due to road conditions or collision with another object the camera will automatically activate the emergency recording mode. This mode can also be activated manually by pressing the red button on the side of the camera, while emergency recordings will be stored separately in a protected folder. Operation is both very easy and intuitive through four units of buttons below the 2.4-inch screen on the back of the camera. On this aspect, because of their superior DrivePro 200 accessed wirelessly through a smartphone based on Android and iOS with Transcend application that can be obtained free of charge at Google PlayStore or Apple App Store. On price , DrivePro 100 which have better quality recordings cost Rp 1.7 million , while DrivePro 200 to access features of smartphones priced at Rp 2.1 million . Both are included 16GB MicroSD card and can be found in Welcomm Shop outlets throughout Indonesia .